This marked the entry into service of a new class of aircraft carriers and the beginning of a new era. USS Gerald R. Ford (CVN 78) with a ceremony at Naval Station Norfolk. For the first time in more than 40 years, the Navy commissioned the lead ship of a new class of aircraft carriers marked the beginning of a new era. In the future all the Nimitz-class carriers will be replaced by new ones. The last Nimitz-class aircraft carrier came into service was the USS George H.W. Bush (CVN 77) that we recently had the opportunity to visit (More details here). The U.S. President Donald J. Trump took part in the ceremony as well as Susan Ford Bales, Ford's daughter, the ship's sponsor. "The nation's going to be very proud of USS Gerald R. Ford," said Chief of Naval Operations Adm. John Richardson. "I am incredibly thankful for the shipyard workers and Sailors who worked amazingly hard to bring this mighty ship to life. This Saturday will be a huge day for our Navy and our nation. The new technology and warfighting capabilities that Ford brings will transform naval warfare, making us a more lethal Navy. The increased combat power will enable new ways to combine information, ships, aircraft and undersea forces, changing how we operate and fight." The Navy plans to spend $43 billion developing and building the three new class ships: Ford, the future USS John F. Kennedy (CVN 79), and the future USS Enterprise (CVN 80). 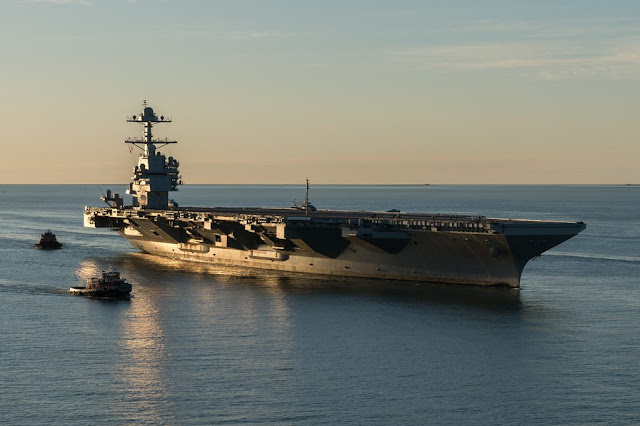 Built by Huntington Ingalls Industries, the Gerald R. Ford class is designed with significant quality-of-life improvements and reduced maintenance. These innovations are expected to improve operational availability and capability compared with Nimitz-class carriers. 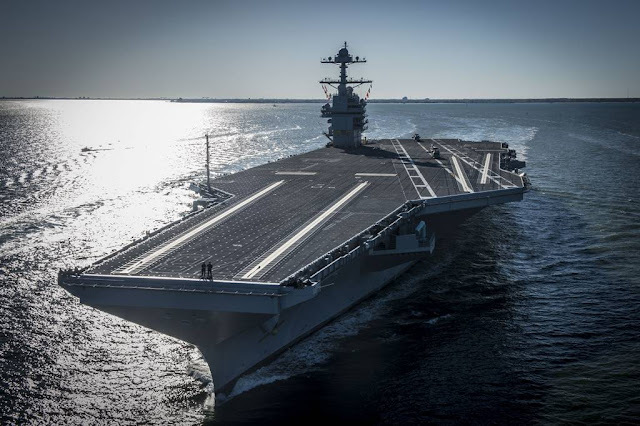 The Gerald R. Ford class incorporates advances in technology such as a new reactor plant, propulsion system, electric plant, Electromagnetic Aircraft Launch System (EMALS), Advanced Arresting Gear (AAG), machinery control, Dual Band Radar and integrated warfare systems. Compared to Nimitz-class carriers, the Gerald R. Ford-class carriers have more than 23 new or modified systems.